What Day Of The Week Is June 20? 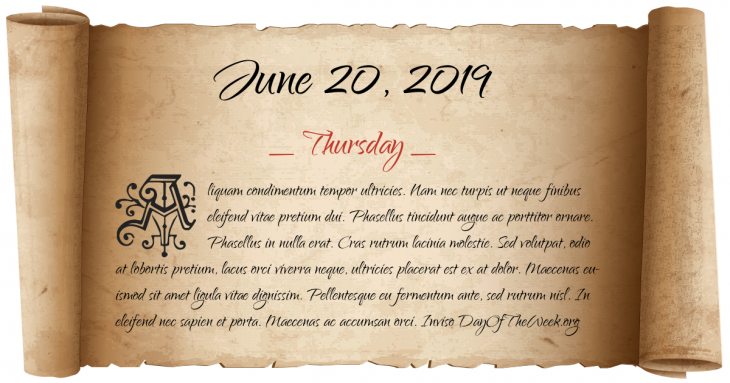 June 20, 2019 is the 171st day of the year 2019 in the Gregorian calendar. There are 194 days remaining until the end of the year. The day of the week is Thursday. On leap years, this day usually marks the summer solstice in the northern hemisphere and the winter solstice in the southern hemisphere. The Argentine base (Corbeta Uruguay) on Southern Thule surrenders to Royal Marine commandos in the final action of the Falklands War. During the Iranian election protests, the death of Neda Agha-Soltan is captured on video and spreads virally on the Internet, making it “probably the most widely witnessed death in human history”. Who were born on June 20?